For the fourth edition in a row, the journal is featuring the stories of conscientious objectors to war, starting with the stories of five men who served in 1-W during the Vietnam War (December 2017), Morris Sherk’s memoir of his Civilian Public Services during World War II (April 2018), and the story of four Hutterite men who were imprisoned during World War I (August 2018). This time, commemorating the one hundredth anniversary of the end of World War I on November 11, 1918, we are featuring the written versions of two presentations during the Voices of Conscience traveling exhibit in Lancaster County, Pennsylvania, honoring conscientious objectors during that war. The first article, by Anne Yoder, the archivist for the Swarthmore College Peace Collection in Pennsylvania, highlights the experiences of non-religious conscientious objectors. In the second, the story of Brethren in Christ Bishop E. J. Swalm is reprised by his granddaughter, Beth Hostetler Mark. Swalm’s story is familiar to many Brethren in Christ readers, but bears repeating for a new generation to understand and appreciate the strong heritage of conscientious objection to war among the Brethren in Christ (and Be in Christ Church of Canada). This retelling also focuses on the lasting legacy of Swalm’s story of conscientious objection. Another missions milestone is documented in this edition—the 50thanniversary of Macha Nurses’ Training School at Macha Hospital in Zambia. Wanda Thuma-McDermond, the daughter of the first Brethren in Christ missionary doctor in Africa (Alvan Thuma) who regularly organizes cross-cultural trips for Messiah College nursing students to Zambia, offers a brief history of the nurses training school, the North American and Zambian nurses and administrators who provided leadership, and its impact on medical care in Zambia. Back in August 2008, the journal carried a series of stories about “growing up Brethren in Christ.” In his new book, Stories and Scenes from a Brethren in Christ Heritage, journal editor emeritus E. Morris Sider reflects on the values inherent in the stories in that volume and on the importance of finding ways to continue the heritage we have been given. 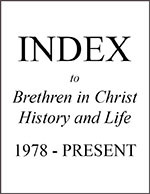 Sider notes that the stories in this book illustrate that in earlier years, the Brethren in Christ sense of community and heritage was nurtured in such settings as General Conference, love feasts, Bible conferences, and revival meetings. In more recent years, we have added settings like Bible quizzing, summer camps, and service and missions trips. The 10 growing up Brethren in Christ” stories in this edition of the journal function as a bridge between earlier years when General Conference was a common experience to later years when Bible quizzing and summer camp were formative. All of the writers for this edition’s collection are “cradle BIC”—that is, they were born into Brethren in Christ families with deep roots in the church. As we continue to collect these stories of growing up Brethren in Christ, it will be interesting to track how those who did not come from “cradle BIC” families and who do not have common shared experiences with others across the denomination describe their experience and what being Brethren in Christ means to them. What will be the common values and shared sense of a community of faith of a new generation of Brethren in Christ? Four book reviews round out this edition. Three of the four books have specific Brethren in Christ connections, while the fourth has relevance for a Brethren in Christ-connected institution.